Alpharetta, GA – (November 2016) – In time for holiday gift giving, Royal Bobbles is debuting its first I Love Lucy Bobble, showcasing the legendary star’s most famous character in her iconic blue and white polka-dot dress. The finely detailed hip-shaking Bobble memento pays tribute to Lucille Ball, one of the most beloved celebrities of our time, and to her iconic creation, Lucy Ricardo. “We are excited to honor the world’s red-headed gem with this unique collectible. Lucille Ball is an all-time favorite, and fans now have an adorable replica to showcase and enjoy,” said Warren Royal, President, Royal Bobbles. The Royal Bobbles I Love Lucy figurine makes an excellent holiday gift, giving consumers the simple pleasure of seeing their esteemed icon daily. Thanks to syndication, the I Love Lucy television show has never been off the air in 65 years. The Royal Bobbles bobble is a keepsake that will last forever. Founded in 2009, Royal Bobbles is a premium manufacturing company specializing in high quality exquisite collectible figurines. All products are made from durable polyresin, allowing for a high level of detail and durability. The Royal Bobbles collection is widely distributed through whole-sale accounts, making them available in museums, gift shops, online stores and mail order catalogs. ALPHARETTA, Ga., July 8, 2016 /PRNewswire/ — This really was a space odyssey for one presidential candidate bobblehead. Bobbleheads.com attached a bobblehead of Donald Trump, standing on a podium flanked by American flags, to a high altitude weather balloon. The bobblehead was trimmed for weight and carried three GPS trackers and a camera to record the momentous event. The launch occurred in Suwanee, Georgia. This is the high point of the launch, at an altitude of over 103,000 feet above the surface of the earth. This is shortly after launch, above Suwanee, Georgia. It took nine months of planning to prep for the Trump space launch and a team of five people with engineering, GPS satellite tracking, video and bobblehead experience to pull this together. They also had to file a flight plan and get clearance from the FAA. The helium-filled balloon, with the Trump bobble and the “payload,” lifted off on Sunday, May 15. It climbed to an altitude of 103,339 feet, which took about two hours; then the balloon burst, which it is designed to do at that height. The bobblehead landed in Abbeville, SC, about 3.5 hours from the launch site, at the top of a very tall tree. Royal said the landowner helped retrieve it, knocking it down with a few well-placed shotgun blasts. The entire launch assembly – bobblehead, podium, flags and microphone – will be displayed in a shadowbox at the company’s Georgia headquarters. For video of the launch, check out this link. A second “behind the scenes” video of the retrieval is in production now and will be published soon. Bobbleheads.com, based in Alpharetta, Ga., designs and manufactures top quality bobbleheads. We pride ourselves on producing the finest collectibles of this type, including custom, one-of-a-kind designs. We offer our extensive collection of bobbleheads – including the Royal Bobbles brand — through our ecommerce website, and we wholesale thousands of products to museums, gift shops, online stores and mail order catalogs nationwide. 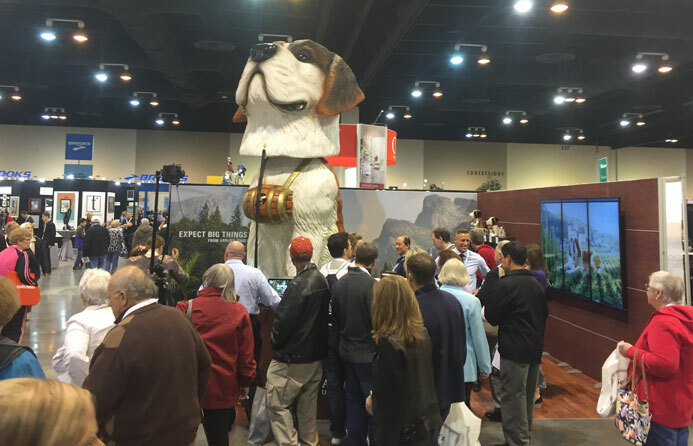 Royal Bobbles was chosen by its customer Applied Underwriters to produce a giant bobblehead of its company mascot “Goldie” – the world’s largest, in fact, for a special event. It was difficult, but we delivered! 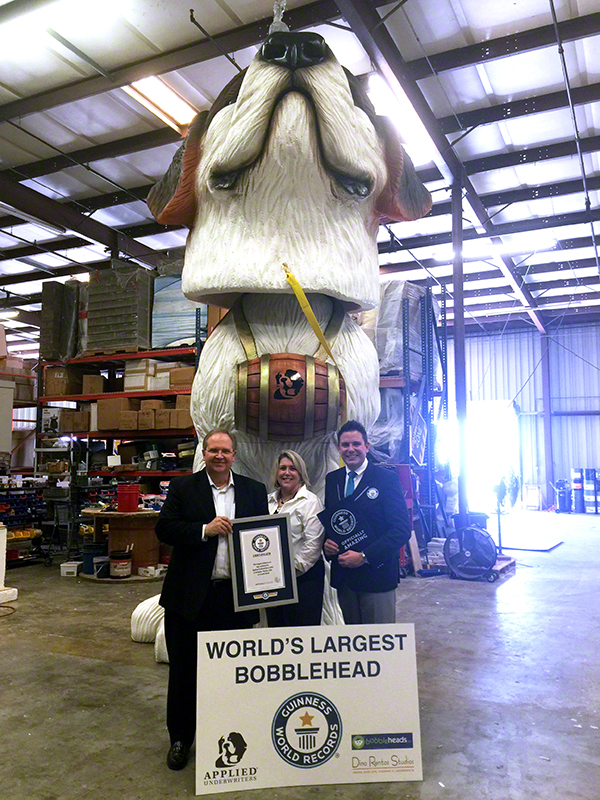 On April 8, 2016, an official Guinness World Records achievement was awarded for the bobblehead, which stands at an official 15 feet, 4.75 inches. Here are photos which show that remarkable achievement.